The road is calling and I must go... a twist on another wandering fellas words, an addition really. The mountains call to me as well... They are sisters, mountains and roads. They whisper to my very soul. This RV Boondocking road is far from its end. It continues to fade away into the mists of distance in front of me... beckoning me to follow. Something along that ribbon of highway has a pull I can not resist. Another mountain poet sang; "To the Mountains I can rest there... to the Rivers I will be strong..."
It happens so each spring. At the end of each long winter, I've built up this wiggly, uneasy feeling. Though we bump around all season in the Arizona desert... and her sky island mountains, we sure aren't static... it's somehow still not the same as "moving on down the road"... knowing that a week from now, I may be states away from where I am with uncounted visions refreshing my spirit. My sense of wonder is renewed each spring; "What ridge will I cross this summer that I've never crested before? What road will I ride I've never gone down before? What trail will I walk that's never known my boots before? What new understanding will I gain?" From what camps will I look up and see that same moon shining back? This wandering life has as sweet a taste as I could ask for. But, it is easy to take it for granted. It is easy to fall back into old ways and lose the trail. Every once in a while a traveler needs to stand back and check his pack. Make sure he's not Wandered off the Trail and got lost. That can be sorta difficult to know... when you've no idea where you're headed. The only way I can describe knowing if you're following the right path is to judge yourself with a pragmatic eye; Are you still engaged? Is that quiet solid feeling still filling your lungs? Are you learning more 'bout yourself each day... or those around you? Can you see a bit of "yourself" in what you perceive as the failings of others... and find a bit more tolerance or forgiveness for their faults? Ha Ha! I too often see a lil' too much of ME in those failings! But when those thoughts get too heavy... I search out a sight like this... and how can your spirit remain low? How can life carry a darkness... when THIS is the window you've opened into your life? Soon we'll start finding our way north... We'll park our rig out in BLM... or in the National Forests... on occasion you'll find us in Forest Service, BLM and even the odd Corps of Engineers campground. But these aren't jewels you can put in your pocket and sell. They are gems that can only be held in your eye and protected in your soul. They are the Shining Times of life. They are the times that feed my hunger to gather ever more of 'em.... before they slip away. The road keeps pulling me along... I don't resist, I can not... I love it so. How many times have you heard that said? ; "Life is a Challenge". So... what're the challenges of livin' High Wide and Handsome... puttin' it in the wind and goin' down the road? They come along and you deal with 'em. The more of 'em you work past, the better you get at it and the challenges begin to get pretty routine... as in... been there done that... gimmee something new! I know... for sure and for certain, that whatever comes at me in the physical world, I can deal with it. Always have... and in the world that stands in front of my eyes... I always will. Those sorts of challenges to me are the sort that you'll find out on the ranges where the vast space tends to have the paradoxical effect of sending your mind to the tight confines inside... pokin' around in all the dark corners of your mind. Have you ever watched that old cult movie from the '70's, Billy Jack? There was a line in there, near the end; He was speakin' to his girlfriend, bullet hole in his side, sitting in the church; "My spirit has been in a rage since the day I was born." Damnation. First time I saw that film I thought they were talkin' right straight directly at me. I might could sound cheerful and serene here once in a while... and in all honesty, I work hard at that. But... always the "Buts" :) ... BUT, for me to be that-a-way just about any time, it's a piece of deliberate, concentrated work! My natural inclination is to grab stupidity and cruelty by the ears and shake it till its ears fall off. So... with all that bein' taken into con-side-ur-a-shun... what's a likely challenge that'd keep me busy on my gypsy travels for a while? Maybe even as long as I've got left? How 'bout seekin' out as a deliberate action... peace and serenity? Now I ain't talkin' 'bout the sweetness and light fantasies of World Peas... ;) I'm talkin' Only 'bout that small little piece of real estate layin' between my ears... and where ever your spirit and soul reside. To get that carved into your own spirit... in such a way that it would be more of an almost automatic response... rather than something you have to keep written on the back of your hand would be a worthwhile goal. ... and let the meaningless din fade away. Where that respite becomes as automatic as taking a breath. The place that gives you the strength to stand strong; when the pressures to conform, to accept the unacceptable, to even actively work against your own beliefs is pounding and clamoring at the gates. For others... though their warrior spirits surely don't lack the courage to take on the task... it is an unending struggle for supremacy between their scrappy, fighting nature... and their will and discipline to be otherwise. I can hear Johnny Cash now. Another storm on the way, this one predicted to put maybe 6" on the spot we're camped... sooooo... we're planning on not being here when it fully arrives. This morning we got up to a rig rockin' wind... which is really sweet... cuz I gotta get up on the roof and put the Solar Panels Down... I'm pretty good about tippin' 'em up to maximize electrical production in the winter time. Well... at least with the wind them bees won't be harassing me while I'm laying the panels back flat! The latest book has now changed names. What I was calling Tears of the Hunter is now... Stalked by a Shadow. It will be the #2 book in my Ben Jensen series. I'm hopeful, though I've been 'behind' on it that it'll be out this summer. It's really caught fire in my imagination the past few days; with some storyline mysteries getting solved for me. ;) Now, I'm as anxious as anybody else to see how it ends! This redhead was hiding back in the naked branches of a cottonwood just as we turned off the road away from camp... onto the sweet trail they've built in Madera. This sort of trail is perfect for most of our meandering. They say that an easy strolling hike is better for you than pushin' and straining. To this Ol' drifter it makes sense. If you're the sort that has a tendency to let their shorts get too tight... putting pressure on yourself to forge ahead against the mountain, against the wind, challenging yourself all the time... rather than just moving along, sweet and easy... it makes sense that all you'd really succeed in doing is adding to the pressure. This don't look much like a trail head does it? This Madera is another of those special places... with its own quiet personality...I wonder if a part of that isn't because people have lived on and loved this land for so long? Looking Back... and Looking Forward. ... and then a Grinning;"I thought so! That HAD to be You!" Sunday afternoon it was Rich and Kay from Ohio! Hell, I'm even gettin' better at recollecting names 15 seconds after they speak 'em! Maybe this'll all help ward off the continuing onset of Old Timers Syndrome. Yeah, I know. That's a dangerous place for me to wander! But, people write me all the time thanking me for inspiration and guidance... Wow... That people take the words I write and make decisions based on that was startling and scary at first. "What have I done to 'em?!!!" To claim it a heavy burden would be arrogance... Yet it is one for which I appreciate the responsibility involved... and it's reshaped my thinking over the past few years. What's rattlin' 'round the Ol' Brain Pan now is; When people read here and then start off on their own, What is it they want out of this gypsy life? 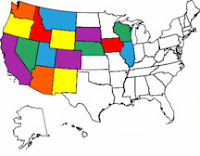 What do they expect when they step off on a full time RVing or RV Boondocking life? and how many actually succeed? By success, I mean; How many actually Find what it might have been they were searching for? and how many turn "Home" in disgust and boredom? In there somewhere lays something I fret over a bit here and there; How many turn away believing I misled them? When they failed to find the "picture" I painted... am I to blame? Now, if you measure it by the lack of pressure on my heart and soul... I am also succeeding brilliantly. I am where I have always belonged; Nose to the wind on the open road... A man, drifting across the face of the earth in what HE sees as his Freedom. Like the Red Tailed Hawk just soaring and watching... doing his thing in the place HE belongs. In that, my success is towering in my own eyes. Where I still need work is in finding that spiritual place where the combat with the un-ceasing efforts of the world at large, to turn bunch quitter loners like me back into the obedient herd... is a more subconscious muscle memory thing... rather than the grinding, emotional, shorts-in-a-knot thing it often becomes. I need to polish my Cowboy Zen parts juuuuuust a mite more. If you are one who isn't and hasn't been driven (like this writer has been) by a restless urge to just always keep moving on... his whole life... but traveling Full Time in an RV seems to have captured your imagination, I'd suggest starting out with a Specific Time Frame in mind; One year, two years, whatever. Go so far as to post some future date in your journal or on a sticky on your refrigerator. Plan at the end of that time, on that date, to re-evaluate where you are... and where you are going. Don't start out with the idea that THIS is a how it will be, cast in concrete, can't change a thing end of discussion decision. Don't box yourself into a place where you keep on pushing yourself down the road, because you're embarrassed to admit it doesn't work for you, if over the miles you've determined that it's something that just doesn't fit. Many are going to find that the place that fits them best... is the place they left behind. You didn't fail. There is NO Shame... You Learned. There is no need for embarrassment. Go back there, go home. With your new found knowledge and experience, and many fine memories, go back and change those things that pushed you to leave. Many are going to find that they've stimulated something deep inside and the thought of taking off their tires and putting the rig up on blocks just makes their heart ache. Many are going to find that the wandering gypsy way isn't something that jumps them out of bed in the morning laughin' and gigglin'. They simply climb out with the calm, serene feeling of belonging right exactly where they are. Their breath comes deep and full... and in their way, content. One thing I can tell you is... out here on the road, that negativity and effort to turn you from your chosen way that you experienced when you first started out will never go away. It might fade a lil' bit and it might become more coy and shaded... but it remains. You will still, on occasion, find yourself questioning your choices. Forewarned is forearmed. You already know I spend a lot of time... too much time... wondering and questioning... I find myself trying to convince myself that I should go back to some version of the "Old Life"... that world where you serve the man and Soh-sigh-uh-tee. Feelings of what a selfish person I must be for my wandering ways float around and bite in unprotected moments. Then I realize, and not in arrogance... but a clear and pragmatic view... I AM serving society and the community. We all are. By preserving our free choices, options and dreams... we preserve the possibility for other people to pursue theirs. Guiding our OWN lives onto those shining sunny slopes where we are fulfilled and our self-worth is healthy and whole, where ever those Sunny Slopes may lay; we contribute to a stronger and more complete society. It is Not selfish. It is what is right and proper. Making our lives a strong thread in the fabric of the world around us is THE right and proper thing for us to be doing. ... and I'm takin' a lil' risk, if you're the superstitious sort. The anniversary of our moh-bile power station passed last September/October. 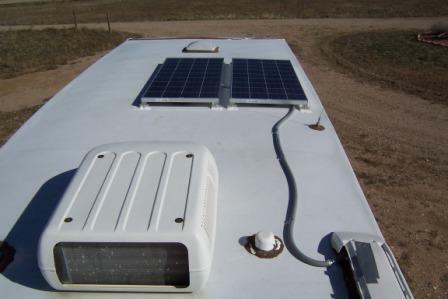 I installed the final bits of our RV Solar power system and it went into production in mid October of 2006. That makes the current system just two months shy of 6 1/2 years old. In fact, it's so old... I wasn't even blogging yet! I disremember just how long the batteries had been in place. 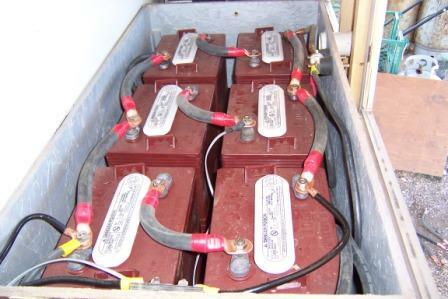 I believe the RV battery bank went in the month before. Just a short time after the install I had to go back and re-do the battery cables, as my initial work had been less than my "inspector" approved of. You might remember that I'd originally planned on having at least four panels, hopefully more. Our real estate debacle, and other resulting di does along the way have kept that from happening. Just the same, I spend as much time fiddling with the electronics on this rig... writing my sites, blogs and books as anybody, plus we generally read well into the evening requiring the lights to be on... and then after the furnace keeps us from freezing in the night I get up and fire up the coffee maker in the morning. That RV Solar Power Battery Bank of ours has seen juuuuust a few ampere hours of juice flow through it over the years. I remember folks warning us that it'd need replacement ... um... quite a while ago. That replacement has been planned and aborted due to "circumstances" of the difficulty kind... on a couple of occasions. I've decided that it's kinda like cowboys. When I was a kid, just startin' out ~ Cowboy ~ I got told; "What are you doin' that for boy? Cowboys are a dyin' breed!" ... or at least she reads while I tap tap tap on the keyboard... If I'm not reading. ... and I don't have to worry about the generator growin' legs when we're not at the rig... or worryin' about the price of gasoline for it, or even having gas for it much... or... even running it beyond some top off runs in poor weather in the winter. After say March... it seldom gets run until down into November... and then only when the weather blocks charging. When you keep yourself as far from the benefits of deep pockets as I seem so skilled at doing! ;) Parking out where the rent is Zero... and having your own power plant just hummmin' away making essentially free power... unsupervised... while you go off and take a walk in the park is pretty damn fine! When we get up against it... we just find a good place to set up for a few weeks and settle in. Our expenditure for camp fees, diesel fuel, generator gas and all those nicks against our income that go along with being on the road... pretty much come to a screeching halt! That's juuuuust 'bout as frugal living as it can get and still not get frost bite! Yes Sir! When it comes to RV Boondocking... our RV Solar Power System is likely the shiniest investment we made... and one of the best You'll ever make.